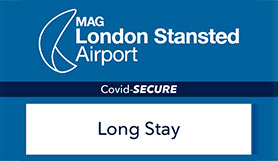 Long stay Super Saver product at Stansted airport. Book this product at a hugely reduced price. Not always available, book as soon as you see it! Parking bays for Blue Badge holders are in zone Q. Use the help points at the bus stops to request a pick-up when you want to transfer to the terminal. The courtesy coaches are wheelchair accessible. Parking charges are calculated in blocks of 24 hours, starting from the time you arrive at the car park. If you need any extra days' parking, the car park will charge you for the extra days at its normal rate. If you don't use all your parking, unfortunately we can't give you a refund for the unused days. You need to give us your car registration number either when you book, or sometime before you go. Non Flexible rate. Bookings can't be cancelled and can only have personal details amended. This car park operates an Automatic Number Plate Recognition System (ANPR) so the barrier should rise for you upon arrival. If the ANPR doesn't recognise your number plate, please press the call button for assistance and a member of staff will open the barrier. Please DO NOT take a ticket if the barrier doesn't raise. When you arrive back from your trip, follow in-terminal signs for 'Buses to Long Stay and JetParks car parks'. Courtesy buses are located at the Long Stay and JetParks parking bus stop in front of the terminal. Please tell the driver where you have parked (i.e. Long Stay, Zone E, Bus stop 3). Once you have arrived back to your vehicle, drive up to the exit barrier. The barrier will open for you to exit but if you do experience difficulties, please press the call button for assistance. Take the left hand lane and follow the filter left. At Priory Wood Roundabout take the 1st exit onto Round Coppice Road, you will pass the Hilton hotel on your left and at the next roundabout take the first exit into the Long Stay car park. Take the A120 exit to Stansted Airport, At Priory Wood Roundabout take the 2nd exit onto Round Coppice Road, At the next roundabout take the first exit , you will pass the Hilton hotel on your left and at the next roundabout take the first exit into the Long Stay car park.